This Thursday, Gov. Sununu will deliver his budget address in Concord, where he will highlight his priorities for the coming session. The question that many have is “what will those highlights be?” Paid Family Medical Leave? Healthcare? Education? And most importantly, does he mean anything he says? Sununu has a long track record of failing to follow through on flashy promises to Granite Staters. We are just 11 days away from this incredible event! 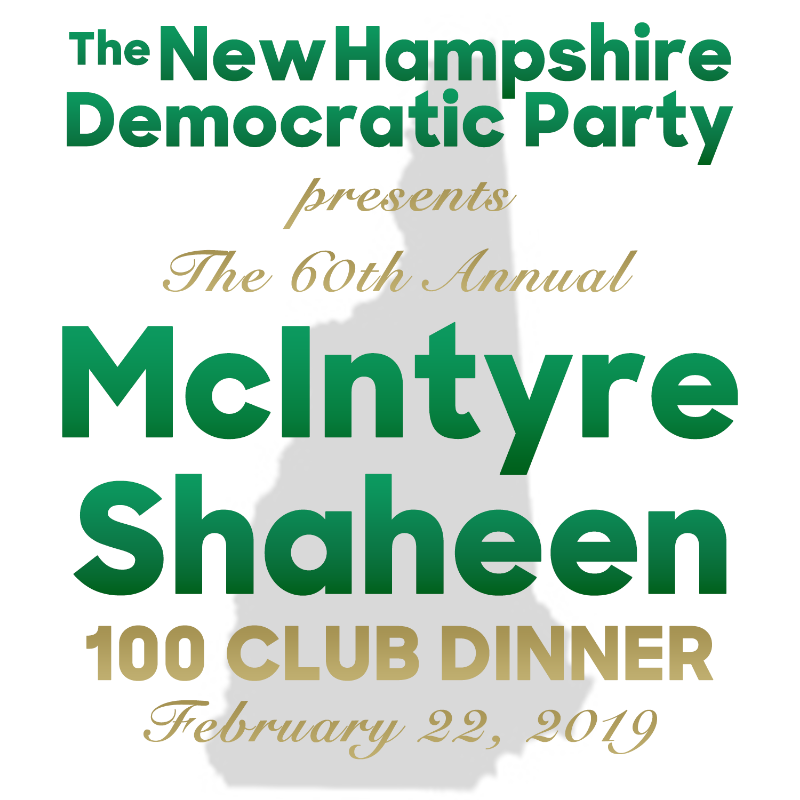 Buy your ticket today to hear from our special guest Senator Elizabeth Warren and to join hundreds of other Democratic activists and elected officials at the 60th annual McIntyre-Shaheen 100 Club Dinner! SENATE – Education and Workforce Development – SB 247, establishing a sunny day fund in the department of business and economic affairs. Why this matters: This bill would establish a “Sunny Day” Fund. Given New Hampshire’s strong economy, Democrats want to invest more money in important projects for long-term economic development. This bill would provide funds for areas like education and infrastructure and shows that Democrats are thinking about how best to secure our state’s long-term success unlike Republicans, who are only thinking about themselves. SENATE – Ways and Means – SB 301, relative to the rates of the business profits tax and business enterprise tax, and relative to revenue sharing with cities and towns. Why this matters: In Sununu’s 2017 budget, he pushed through a $100 million tax cut for the wealthiest 3% of corporations that they didn’t need and didn’t want. Democrats want to make sure Granite Staters are the ones who get tax cuts not Sununu’s highest dollar donors. This bill would rectify Sununu’s disastrous budget and give relief to those who deserve it immediately. SENATE – Health and Human Services – SB 292, relative to implementation of the new mental health 10-year plan. Why this matters: Democrats are taking the lead on the 10-year mental health plan to make sure all Granite Staters have access to the treatment they deserve. This bill would lay out the long-term goals for New Hampshire as we seek to give everyone suffering from a mental illness treatment and resources. HOUSE – Education – HB 101, relative to regulating possession of firearms in a school district. HOUSE – Education – HB 564, relative to possession of firearms in safe school zones. Why this matters: Both of these bills seek to give school districts the right to ban guns from their own campuses, something that is currently not allowed. Despite the growing number of devastating school shootings, Sununu has maintained his blind support of the NRA and actively supports current New Hampshire law, which forces school districts to allow guns on campus. It’s time we put this decision in the hands of the school districts themselves. SENATE – Finance – SB 1, establishes a system of paid family and medical leave insurance. Why this matters: Paid Family and Medical Leave support working families who need to take extended time away from work to care for a loved one. After torpedoing last year’s Paid Leave bill and calling the program a vacation (twice), Governor Sununu promised he would support the bill and laid out specific parameters that he required for viable legislation. Democrats complied with all of these specifications, but that didn’t stop Sununu from staging a photo-op announcing an underdeveloped and unrealistic plan that’s really nothing more than an idea. SENATE – Finance – SB 5, appropriation relative to Medicaid provider rates for mental health and substance misuse. Why this matters: New Hampshire is continuing to fight the battle to provide adequate health coverage for mental health and substance abuse. This bill would increase subsidies for Medicaid, encouraging doctors to cover more procedures under this program, thereby giving Medicaid recipients better coverage and care. This will be a positive impact on communities across New Hampshire. SENATE – Finance – SB6, relative to child protection staffing and making an appropriation therefor. Why this matters: For years we’ve seen how a poorly funded Department of Children and Youth Family Services can hurt Granite State children. Following the recommendations from the recently released DCYF audit, this legislation would gradually provide enough funding to support adding additional workers to ease the burden on current staffing and lower case numbers. In proposing this bill, Democrats seek to remedy past problems and give families the attention and resources they deserve. SENATE – Education and Workforce Development – SB 142, requiring feminine hygiene products in school restrooms. Why this matters: It is important that all students have a distraction-free learning environment. This bill does just that. Many students do not have access to feminine hygiene products which causes a distraction in the learning. Feminine Hygiene Products would be made available for free in public schools restrooms. HOUSE – Labor, Industrial and Rehabilitative Services – HB 211, relative to inquiries by prospective employers concerning salary history. Why this matters: Would bar companies from asking for a candidate’s salary history on an application. This process helps keep women from getting salary equity in the workplace and maintains systemic sexism in the workplace. HOUSE – Labor, Industrial and Rehabilitative Services – HB 211, relative to criminal records checks in the employee application process. Why this matters: Would bar companies from asking for a candidate’s criminal record in the job application process. As job seekers look for upward mobility, they can hit a brick wall due to these background checks. This bill would end discrimination based on the applicant’s past. Join Democratic candidate for Nashua Alderman, Ben Clemons, and knock doors for his upcoming special election on March 5th. As the first election following the historic 2018 Midterms, we can’t let the Republicans steal away any of the momentum we gained last cycle. When: Sunday at 10:00AM in Nashua. For more info, contact Slate at sgoodwin@nhdp.org. Town Meeting Day is just a month away! At the beginning of each year Granite Staters vote on important local elected officials such as Selectman, Supervisors of the Checklist, Moderators, etc. These non partisan elections don’t get the attention that they deserve, and many positions go unopposed. If Democrats are not recruited to run for these positions, they cannot win! It is up to us to make sure we are recruiting Democrats to run for each and every position. In 2018 we elected over 600 Democrats to these critical offices. Let’s keep it going! Lebanon Municipal Elections are also on March 12th. If you know anyone running for the March 12th Town Meeting Day, please email our political team at political@nhdp.org. Here’s to even more Democratic victories in 2019, 2020 and beyond! As the First in the Nation Primary season officially heats up, please use this section to learn about when candidates will be visiting the state! Please note: This is a list of public events that candidates have made us aware of. 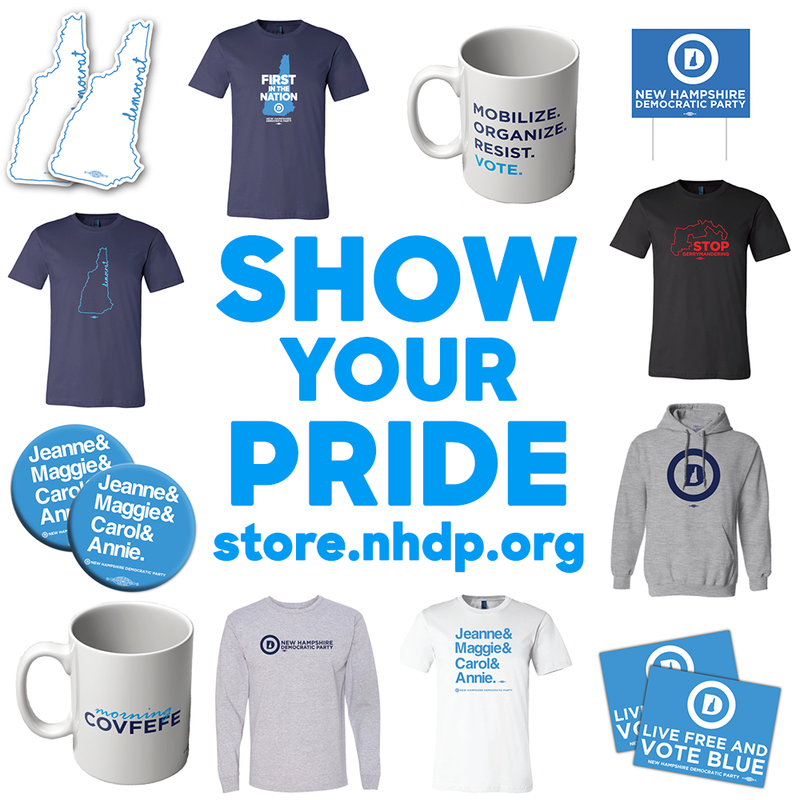 The New Hampshire Democratic Party does its best to track all candidate and potential candidate visits to the state, however, if you are aware of a pending trip not listed or have more details on an event, please reach out to the office at political@nhdp.org to let us know! This communication does not imply an endorsement or favoritism of any kind to any Democratic candidates actively engaged in competitive primary contests. Reminder: Per DNC bylaws, all public events hosted by the NHDP, County Committees, Regional Committees, and Town Committees must be open to the press. All members of town and county committees with specific issues should reach out to their regional point of contact. Donnie Spencer is the NHDP’s new Grassroots Director after serving as a Field Organizer for the Coordinated Campaign. He will also be the point of contact for Belknap and Carroll Counties and can be reached at dspencer@nhdp.org. Slate Goodwin is now the Party’s Outreach Director after serving as a Regional Organizing Director during the Coordinated Campaign and will be the point of contact for Coos, Grafton, and Merrimack Counties and the cities of Manchester and Nashua. He can be reached at sgoodwin@nhdp.org. Ben Ernst is the former State Senate Campaigns Director and is the NHDP’s Political Director. He will be the point of contact for Cheshire, Rockingham, Strafford, and Sullivan Counties and the towns of Hillsborough County. He can be reached at bernst@nhdp.org.